(PPP) 1.90 Bln. 3.04 Bln. 4.41 Bln. 5.77 Bln. 7.12 Bln. 16.09 Bln. 16.69 Bln. 17.70 Bln. 18.60 Bln. 19.51 Bln. 22.44 Bln. 22.93 Bln. 25.41 Bln. 27.30 Bln. 29.71 Bln. 30.56 Bln. 28.96 Bln. 28.55 Bln. ^ "World Bank forecasts for Chad, June 2018 (p. 153)" (PDF). World Bank. Retrieved 11 September 2018. 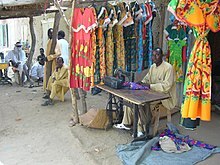 ^ "Ease of Doing Business in Chad". Doingbusiness.org. Retrieved 23 January 2017. ^ "Export Partners of Chad". CIA World Factbook. 2015. Retrieved 26 July 2016. ^ "Import Partners of Chad". CIA World Factbook. 2015. Retrieved 26 July 2016. ^ "Report for Selected Countries and Subjects". www.imf.org. Retrieved 24 August 2018.